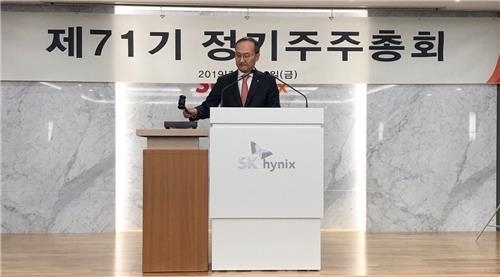 Amid concerns growing over slowing demand for memory chips, SK hynix CEO Lee Seok-hee said Friday he would focus on strengthening the chipmaker’s fundamental competitiveness and improving the chip yield rate to cut production costs. The CEO of the world’s second-largest memory provider also viewed that supply and demand would strike a balance in the second half of the year. The remarks came after a series of gloomy earnings forecasts published for SK hynix’s first-quarter performance. The market consensus on the chipmaking arm under SK Group stood at 2.09 trillion won ($1.85 billion), plunging 52 percent from the same period last year. Despite market concern, the world’s second-largest memory provider will also bet its future on its project worth 120 trillion won, planned in Yongin, Gyeonggi Province, the CEO said. The company plans to build four fabrication lines for semiconductors and start operations in 2022. It is waiting for the municipal office’s approval for granting 4.48 million square meters of land for the chipmaker’s semiconductor cluster. At the 71st general meeting of shareholders, Oh Jong-hoon, executive vice president of global sales and marketing, was appointed an internal director of the board. Shareholders also approved the company’s recommendation of having Ha Yung-ku, former chairman of the Korea Federation of Banks, as an outside director. Meanwhile, shareholders also approved a plan to grant CEO Lee 179,763 shares in stock options.